Paw Print Genetics - So what is it? Dominant, Recessive, not genetic at all? So what is it? Dominant, Recessive, not genetic at all? One of the key issues that people often have in grappling with genetics disease is the fact that genes and disorders that are supposedly genetic don't always make sense (or at least not the sense that people expect them to make.) What they see occur does not pass their intuition or logic of what they think they should see if the condition is really "genetic." A problem will be identified that has never occurred before and people will say in all honesty---"that has never happened in my line" and yet they are told it is "genetic." This happens in human families as well. A genetic condition is diagnosed in a child and the first thing that both grandmothers say is "that did not come from our side of the family!" In some cases they may be wrong and in others they may be right. Different genes follow different "rules." Recessive disorders in fact come from both families and are due simply to the fact that both the sire and dam happened to carry the same detrimental recessive gene. These can be passed on for many generations unrecognized and only revealed when two carriers happen to mate AND both pass the same detrimental gene to the same offspring. (In some cases people are lucky and two carriers are mated together and no affected puppies are produced---this is going to happen some of the time based on chance and those two carriers will remain unrecognized unless they have genetic testing.) In the case of a dominant condition, on the other hand, only one parent/line is responsible for the condition and the other made zero contribution by passing on a completely normal gene. A condition is dominant when the presence of only one copy of the gene can be responsible for the condition or trait. Dominant diseases are often confusing to people especially when neither parent appears to be affected; but one copy of the gene can cause the condition but not always. This is because some dominant conditions can have decreased penetrance and variable expression. How does this work? Variable expression means the presentation or severity of the condition can vary from individual to individual - in some cases the parent may be affected but so mildly affected that they are difficult to recognize or diagnose. Variable expression can also effect the age of onset. One individual in the pedigree may present at six months of age while their parent may not present until they are 7 years of age. Decreased penetrance is when the individual has the dominant gene but is completely unaffected by it. Why the condition does not "penetrate" is often unknown, however, this individual may still produce the condition in their offspring with the same chance as if they were symptomatic and showed symptoms of the condition. Adding to the confusion, is the same disease, or what appears to be the same disease, can be a recessive disease in some pedigrees, in others a dominant disease and in others the symptoms could be caused by environmental factors. People may be told that the problem in their dog is genetic and then hear of the same disease in another dog in which it is not genetic at all! People are sometimes left to conclude that the "geneticists" and veterinarians are confused and do not know what they are talking about! But the answer is yes - what appears to be the same condition can be cause by completely different genes or sometimes even the environment. Clear examples of this exist with conditions like epilepsy, cataracts, cancer (less clearly defined in dogs at this point but many examples in humans) and with what would appear to be clearly "a disorder" like Progressive Retinal Atrophy, PRA, degeneration of the retina over time often to create blindness. Several genes and gene mutations causing PRA have been identified in dogs. Most are autosomal recessive, some are X-linked recessive (in the Siberian Husky and the Samoyed) and one is autosomal dominant (in the Bullmastiff and English Mastiff). Central PRA and sudden acquired retinal degeneration (SARD) are conditions with different causes that closely resemble PRA. cPRA (also called retinal pigment epithelial dystrophy-RPED) can occur in older dogs and has been found to occur due to nutritional deficiencies. SARD is not considered to be inherited and can occur in any dog. Pictured are two dogs that would seem to have the same appearance but who actually have entirely different genes that result in their unique hairless feature. 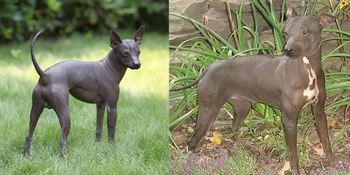 To the left is a Xoloitzcuintle or Mexican Hairless, a breed that has been shown to have a dominant mutation in the FOX13 gene that causes their hairlessness. The dog to the right is an American Hairless terrier with an autosomal recessive mutation causing what appears to be a relatively newly occurring form of hairlessness. A casual observer would assume these two dogs have the same genetic mutation causing their appearances. Accurate diagnosis is important when dealing with the possibility of genetic disease. At Paw Print GeneticsTM dogs can be screened for several genetic disorders and if identified with mutations, can be managed in ways to avoid the occurrence of disease in offspring through selective breeding practices. This article exemplifies my own trouble with words used in a scientific realm. Where I had thought that "known genetic issues" meant health problems, I see there is a distinct difference and what we hope for are known genetic problems. Thanks for the article, Martine. Thank you very much Britain! We hope for this series of blogs to clear up some commonly held misconceptions. And yes---where we can clearly define genetic disease we can squarely address it.